What images does the term Scottish Dress bring up in your mind? For most people what immediately springs to mind is the kilt, usually worn with all the accessories, but wait a moment, isn't that Highland Dress? Before the early 19th century the kilt was indeed Highland Dress, and people living in the Lowlands of Scotland would not have dreamt of wearing it. In fact before the battle of Culloden in 1745, most Scottish Lowlanders felt nothing but fear and mistrust towards the Highlanders, and their kilts were seen as a primitive form of dress. Most of lowland Scotland identified with England, and the Highlands were seen as hostile and dangerous. So what happened to make the kilt not only Highland Dress but Scottish Dress? Well in 1822 King George IV made a state visit to Scotland, with the aim of increasing his popularity North of the border. The pageantry was very well staged by Sir Walter Scott, who at that time had written a novel romanticizing the Scottish Highlands and its culture. The king was seen in full Highland Dress (Royal Stewart tartan), and most of the Lowland Gentry were persuaded to wear kilts, thus establishing Highland Dress across Scotland. And today the kilt is firmly established as Scotland's National Dress. 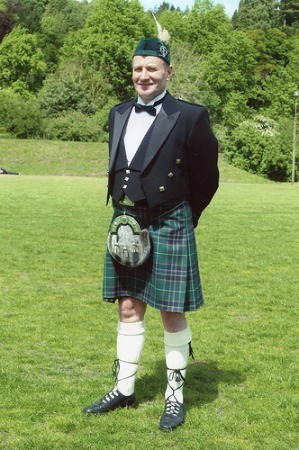 The photo below shows a typical example of Scottish Dress, in it you see the Chieftain of the Hawick Highland Games. Notice the feather being worn in his cap, only clan Chiefs are entitled to wear such feathers. 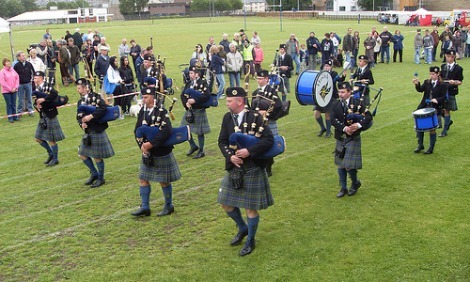 The next photo shows the Hawick pipe band performing at the Hawick Highland games in 2008. They are wearing kilts in the Hawick Town tartan, which would have been especially designed and woven for the town. If you look closely you will see several women playing with the pipe band, this is becoming a fairly common site these days. The third photo to illustrate this page is yet another clan Chief, note the feather in his cap. 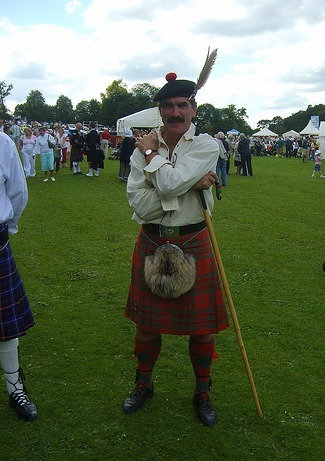 He is wearing a Livingstone tartan, and is attending the Harpenden Highland Gathering, July 2007. Casually dressed as he is for day wear, he cuts a stunning figure in his kilt and Jacobite shirt, as I'm sure you'll agree. If you look at the history of the kilt in the Scottish military, you will see that the army played a very significant role in assuring the kilt's survival, after its use had been banned. Traditionally the Highland regiments have always worn kilts, whereas the Lowland regiments traditionally wear trews, (tartan trousers). Therefor both uniforms are considered Scottish Dress, and both can be seen being worn by the various Scottish units which go to make up the newly formed Royal Regiment of Scotland. Military pipe bands from what were formerly Highland and Lowland regiments both wear the kilt as part of their uniform. often imitate the uniforms of the military bands, and while women normally don't wear kilts, those who perform in pipe bands do for the sake of uniformity. So you can see how the Highland Dress evolved to become the most famous National Dress in the world, and it is proudly worn in all parts of Scotland and across the world.